Norfork Lake fishing has not changed much over the last couple of weeks, which means the striped bass bite continues to be strong in deep water and all other species are biting in 0 - 20 feet of water. I haven't had a chance to fish my normal 5 days a week, but when I have had the chance to get out the bite has been strong. 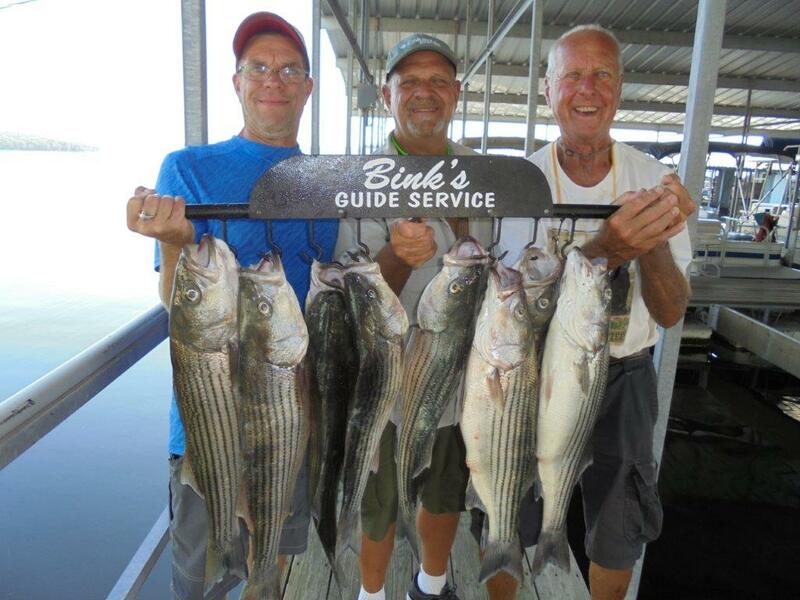 Striped bass are being caught from south of point 2 to the dam and east of the dam to the Jordan Island area. 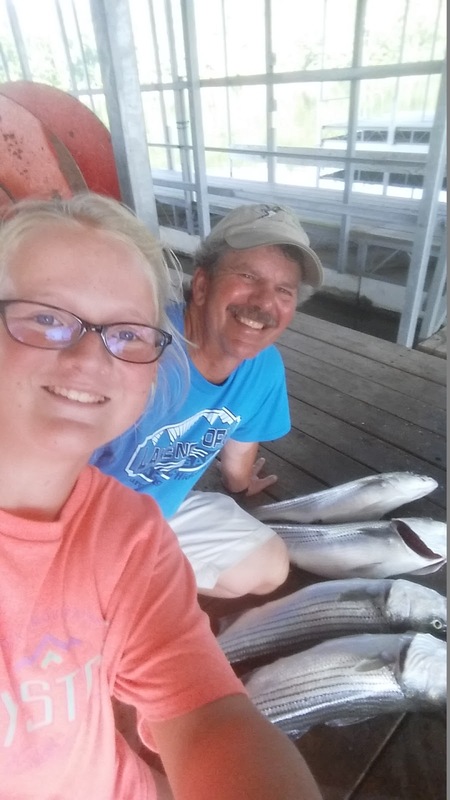 The larger stripers are being caught in 50 - 70 feet of water. They're lying on the bottom early in the morning as well as during the day. Live bait is working very well but several artificial baits are also working. Vertical jigging with a spoon, as well as, jigging with a small 3 inch grub (green or off white) on the bottom. 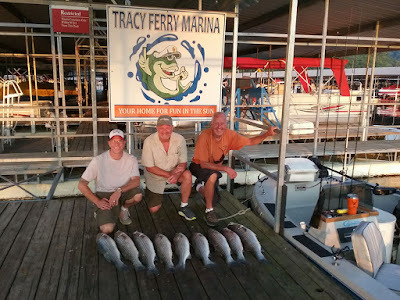 The main tactic at this time is to move your bait very slowly along the bottom. Keep your bait small and move it slowly and you will catch fish. 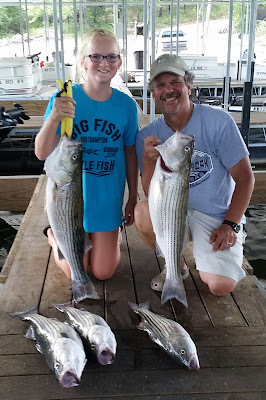 Trollers are picking up some nice stripers, but again you will need to get your bait down below 45 feet. I have been watching many nice sized largemouth bass swimming around in about 3 feet of water early in the morning in front of our dock. Our gravel parking lot is still partially under water and the bait fish and small blue gills are loving the warm water. Bass are having a field day feeding at will. I guess what I am trying to tell you is look for those flooded roadways early in the morning and cast out your favorite plastic bait (Crawdad) or swim bait and you should pick up some nice fish. I am also noting some bass hitting the surface early in the morning as well as at sunset. Walleye fishing has also starting picking up. The best water depth is around 18 feet on large rounded points. Use a crawler harness with a bottom bouncer or drop shot a live minnow to pick up some nice fish. Blue gill are also in the 18 feet of water depth. Crickets have been one of the best baits at this time. Hybrid bass and white bass have been sporadically erupting in the mornings. 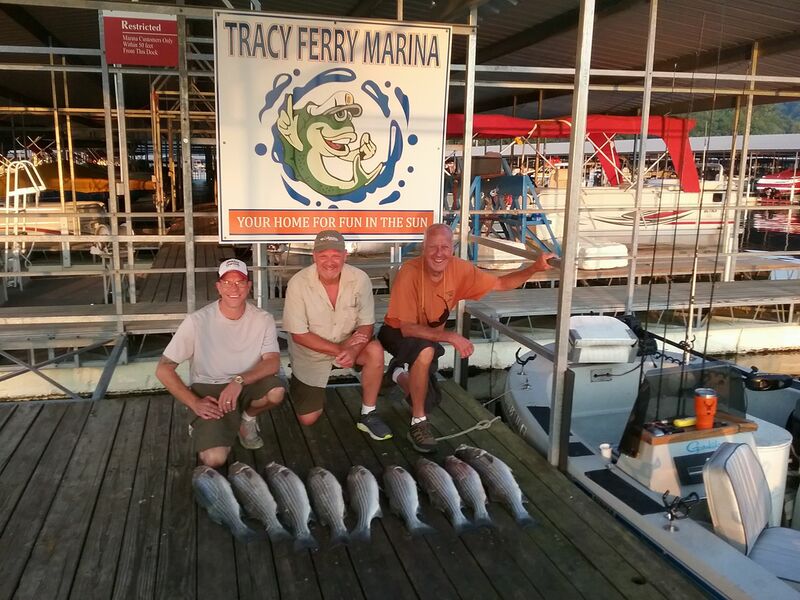 I have gotten reports from all different areas of the lake with top water action. There has been some nice sized hybrids and mid sized whites coming up and feeding on small shad. Norfork Lake level is falling around 2 - 3 inches per day and currently sits at 568.86. The lake is clear to its normal green summer time tint. The surface water temperature has reached 90 degrees, plus or minus a few degrees.